I stare in respectful silence at this knight errant, who has been led for unknown reasons to the solitude of the Lacandon jungle. He looks... peculiar. Durito has baptised his tortoise, sorry, horse, with a name that sounds completely daft: Pegasus. 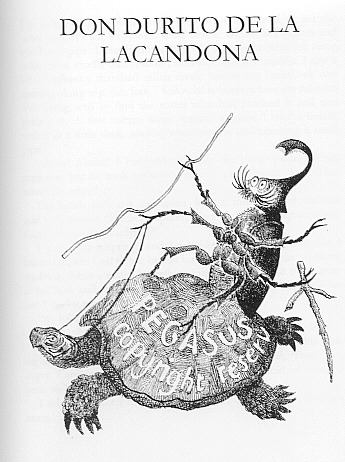 So that there may be no doubt about it Durito has written on the tortoise's shell in large bold letters: 'PEGASUS. Copyright Reserved.' And beneath this: 'Please fasten your seat belts.' I can barely resist the temptation to compare it to the economic recovery programme. But Durito turns his mount, so that I can see the other side. Pegasus takes his time, so that what Durito describes as a 'giddy spin' by his horse, is in fact a slow amble round. The tortoise performs this movement so carefully that one might think it was afraid of getting dizzy. After several minutes I can read on Pegasus' left flank: 'Smokers' Section. No Union Cowboys Allowed. Free Advertising Space. Inquiries to Durito's Publishing Company'. But there doesn't look to me as if there's much free space left, as the announcement occupies Pegasus' whole left flank and rear. 'Don't be a clown. That language is only for noble lords, not for good-for-nothing serfs, who, were it not for my infinite mercy, would go on leading their empty lives and never dream of aspiring to know the secrets and wonders of knight errantry,' answers Durito, as he tries to stop Pegasus, who for some strange reason seems impatient to get going. 'Anything. Guerrilleros, soldiers, beetles... and tortoises!' I add this last, observing Pegasus' probable reaction. The tortoise must have believed it was a horse, because it didn't take the point. Indeed, I think I hear what sounds like a soft neigh. I interrupt Durito. It's obvious that he can go on like this for pages and pages and it's me that has to take the flack from editors, especially when the communiqués arrive very late at night. 'To Mexico City,' says Durito, brandishing his swords. This destination appears to alarm Pegasus, because he gives a sort of start, which in a tortoise is like a soft sigh.